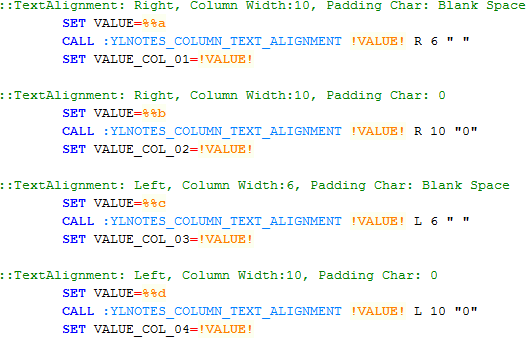 I saw a request on TechNet Forum on how to align column text so that the data looks very neat. I always think that it is very difficult to achieve this on Windows Batch Scripting, so out of curiosity, I somehow successfully wrote this on Batch Script. S2-2. For each column, we need to set the column parameter on Text Alignment, Column Width and Padding Character. Call Library Script YLNOTES_COLUMN_TEXT_ALIGNMENT which will return result with text alignment.